Yaktrax is the ultimate snow-accessory company. Named after the surefooted Himalayan beast, Yaktrax offers solutions to icy problems and promise a higher quality-of-life. 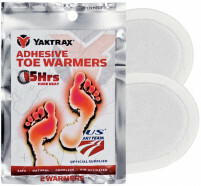 The warmers, socks, and slip-on traction devices made by Yaktrax let you walk confidently through adverse terrain, Yak-style. Open it, shake it, and let your worries dissolve away as the heat builds up. 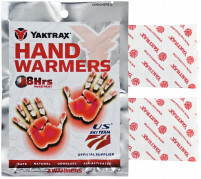 With a 5-year lifespan, these hand-warmers heat up to 135°F (57°C) and are odorless, battery-free, and have a place in every backcountry skiers backpack. The air-activated formul.. Some of us stop skiing earlier than we should when our hands get cold. For others, quitting starts with feet. After trying sweaty socks, inflexible liners, expensive electronics, and homeopathic remedies, it may be time for a simpler solution. Yaktrax toe..